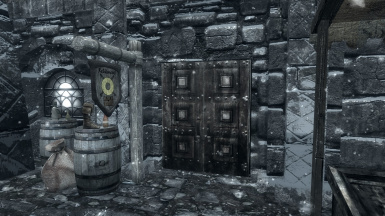 A new guild in Windhelm where you stop a group of bandits from obtaining a power staff. The guild adds 15 new quests. If you are uploading this file to another site please warn me about it my PMs or commenting on this page. If you want to convert this mod to another language you need my permission to do so. And if there is a glitch do not make a patch for it unless it is conflicting with another mod but comment on this page that you have released a patch for the two mods. If there is a glitch in this mod just report it to me by PMs or a comment on this page. You are not to make a mod that requires it or expand this mod. If you have a question just PM me. I would like to thank jet4571 for creating the Relicment Hall exterior model. I will like to thank Tarshana for editing the Bench model and helping me with creating the new loading screen model. I will like to thank ElminsterAU and zilav for making TES5LODGen. If you like to be part of legal guilds and travel across Skyrim then this is the guild for you. With 15 new quests. 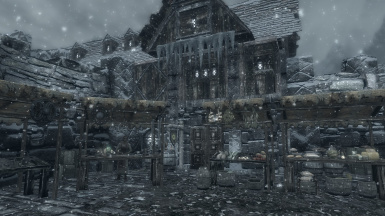 The guild hall is located in the Windhelm Market in the southwestern corner of Windhelm. The guild questline is about stopping a group of bandits knows as the Black Diamond Pact from obtaining a powerful staff called Icejiff. You will be going across Tamriel and Solstheim during your adventure. Watch the Trailer to this mod. And use the How To Play As Alex Border as a bonus. And if you play Oblivion also look at my Oblivion Adventurers Guild. If you want the Skyrim 2011 version go here. And if you play Morrowind also look at my Bloodmoon Rhysk mod. Also Better Gray Quarter mod will conflict with the Relicment. Download the patch here. 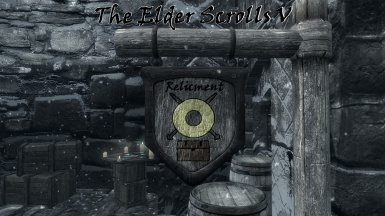 Civil War Battles mod will not have the Relicment Hall in Windhelm. Download the patch here. To install just download then extract folder and drag plugin, and bsa into your data folder. Then Download and run SSELODGen and run the application and check off Tamriel and DLC2SolstheimWorld in LODGen Options and then click on Generate.